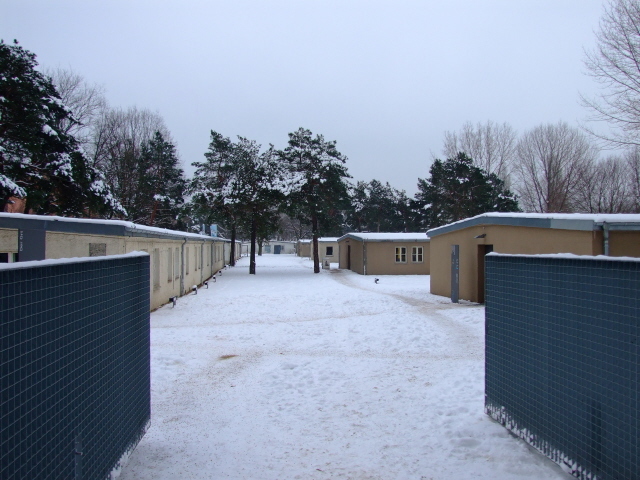 A real rarity: a cluster of surviving original barracks that were once a Nazi forced labour camp in Berlin ... the only surviving authentic ones of their kind in fact. A relatively new documentation centre has been established here, which is still modest in what it offers (especially for foreign visitors), but is likely to be developed further. More background info: There were thousands of forced labour camps in Berlin alone during the Nazi era and especially WWII – often serving to accommodate inmates from satellite camps of the area's main concentration camps (especially Sachsenhausen). 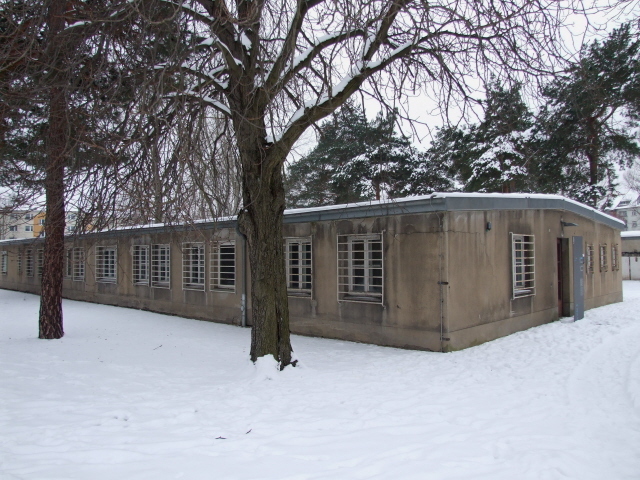 This one was established as camp "GBI 75/76" in 1943 and housed mainly Italian prisoners but also many from Eastern European occupied countries, as well as female concentration camp inmates. These had to work in the nearby industrial complexes, such as assembling batteries at the Pertrix factory (which after WWII continued under the name Batropa, in the GDR, until it was closed in 1999 as a result of chemical contamination). Little else is known about the camp and it was all but forgotten until the rediscovery of the site's historical significance in 1993. So it is all the more a near miracle that these buildings survived. After WWII, one part of the former camp was taken over by a vaccination institute, while the rest was occupied by small businesses and a day-care centre. The former, the camp's western half, had stood empty for years when its historical role was rediscovered. For a while it even was for sale – despite having been listed as a historic complex in 1995. Thanks mainly to the initiative of historical associations, the former camp was saved and the western part of it eventually turned into a memorial site under the aegis of the Topography of Terror Foundation from 2005/2006. Work is still continuing on a future permanent exhibition proper, but there are already temporary ones. It's of rather special interest and a bit of an effort getting there, but it's certainly an interesting addition to Berlin's already rich portfolio of dark tourism sites. And it will only get more relevant, as development of the memorial continues. What there is to see: 11 of the original 13 barracks of the labour camp still survive (the only ones left in Berlin! ), although most have undergone more or less substantial changes to their interiors. 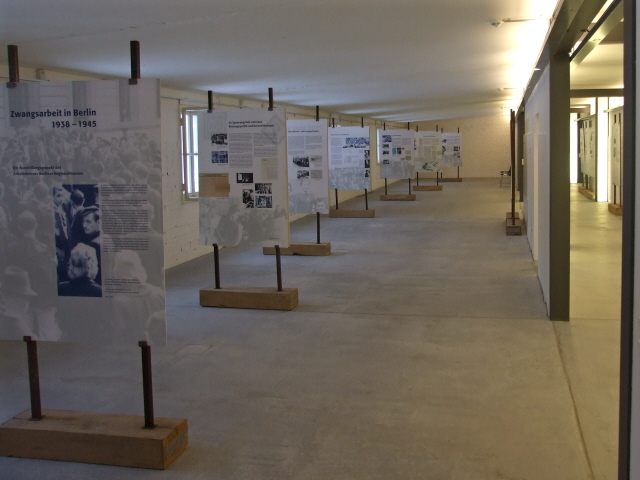 The eastern half of the former camp is still occupied by small businesses and not accessible to the general public, but the whole western half of six original barracks now forms the "Nazi Forced Labour Documentation Centre" and is run under the umbrella of the Topography of Terror Foundation. Only a couple of the refurbished barracks are accessible inside, where currently temporary exhibitions are housed – but a permanent one is in the making. At the time of my visit (in January 2010), one of the exhibitions was a very moving, personalized account of several female forced labourers from Ukraine, who had been interviewed about their experiences at the time. And these insights form the framework of the exhibition. In addition, the wider context was also covered, including the story of (in)famous large companies, such as the Flick industrial empire, who greatly benefited from the Nazis' forced labour system, but were rarely held responsible for their participation in it after the war. The Flick case was one of the most prominent exceptions in West Germany's post-war history. In a high-profile court case in Nuremberg the owner was forced to give up, i.e. sell large parts of his empire, especially in steel production. In the East, industries were nationalized under communism anyway. Ironically, on the basis of the profit made, Friedrich Flick later regained a position as one of the most influential and richest industrialists in Germany – while he never conceded any guilt for his role in the forced labour system during WWII. Further irony was added by the fact that the Flick empire became involved in one of Germany's greatest ever corruption scandals in the 1980s. How the memorial site, and in particular the permanent exhibition currently being developed, turns out in the long run remains to be seen. For the time being, this is a bit on the "exotic" side as a dark tourism destination, which probably presupposes some special interest in its visitors. It is also way out from central Berlin. Thus the effort of getting there may not be worth it for everyone, but should well be considered to be part of a more dedicated dark tourist's itinerary. Location: Schöneweide is way out in the south-east of Berlin Köpenick-Treptow, roughly seven miles / nearly 12 km from the centre (district Mitte). The entrance to the documentation centre is at No. 5 Britzer Straße between Michael-Brückner-Straße and Schnellerstraße near the Spree river, an old industrial quarter in the former Eastern part of the city. Access and costs: a bit awkward to get to, but doable; free. 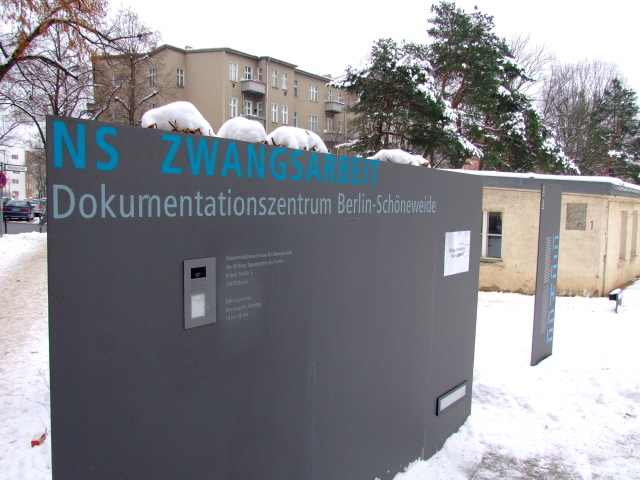 Details: to get to the Schöneweide Nazi Forced Labour Documentation Centre at Britzer Straße from central Berlin it's quickest to get the regional metro train (S-Bahn) line S 9, e.g. from Zoologischer Garten in the west or Hauptbahnhof, Friedrichstraße or Alexanderplatz in Mitte. (When coming from the north-east, you can alternatively take the S 8, and coming from the south-west the S 47 – both also share part of the route of the ring trains.) Get off at Schöneweide station and either walk (ca. ten minutes) or get the 167 bus to Britzer Straße. That bus line also provides a useful connection north-west towards/from Treptow. Time required: depends on whether you can read German or not – if so, you can spend about an hour here, maybe even longer when studying everything in the fullest detail. Without any knowledge of German, a brief scan of the exhibitions will have to do, and a visit to the outdoors parts won't take more than 15 minutes or so either. Combinability with other dark destinations: nothing in the immediate vicinity, but about a mile / 1.5 km east, on Bruno-Bürgel-Weg, a derelict factory building still stands (no access – contaminated with arsenic! 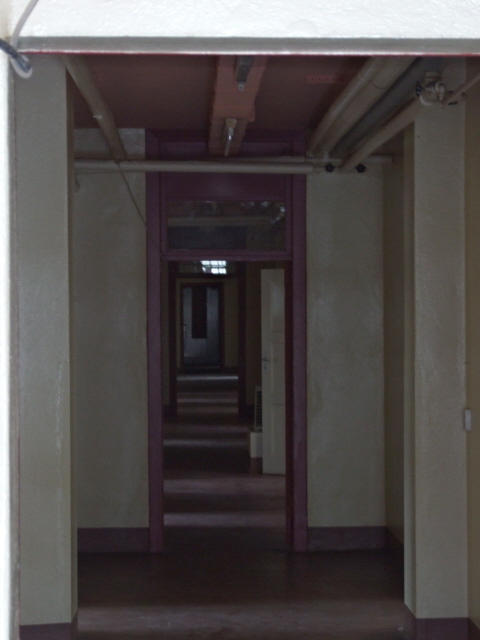 ), which during WWII used to be the Pertrix battery works, where many of the Schöneweide camp's inmates had to work. More accessible is the Soviet War Memorial in Treptower Park, which can easily be reached by bus (line 167 – from the bus stop Britzer Straße to Sowjetisches Ehrenmahl, ca. 15 minutes). From Schöneweide station, tram line M17 goes north to Karlshorst, convenient for combining the trip with a visit to the German-Russian Museum. Combinability with non-dark destinations: see under Berlin in general – the area around the Schöneweide memorial site is anything but touristy.